If you are unsure about what to expect when you first contact us then we hope this page of frequently asked questions will provide useful information. We are friendly and approachable and try to be as flexible as possible with all of our customers, so this is not intended to be prescriptive. We will work with you as required throughout the lifetime of your project. What information do I need to have before I contact you for the first time? In order to contact us we require only that you have a general idea what you are trying to achieve. From there we can help you decide how best to progress your idea. Some parts of it may be inappropriate for us to help with. In this case, we will try to make sure you know where to go for help. However you contact us, you will deal directly with one of our experienced consultants, who can answer specific questions and give initial advice. In most cases this will involve a visit by one of our consultants to your premises. During the meeting we will try to ascertain the business need which you are trying to address and to determine the opportunities and constraints affecting potential approaches. This meeting is normally followed by a written proposal outlining how we believe Tron Systems can help, together with timescales, costs, and any items that you may be required to provide prior to further work. Work involved up to this point is free of charge. Only if you are happy to proceed with the proposal will any charges accrue. This approach allows our customers to ensure that they have both the means and the budget to achieve their business goals. 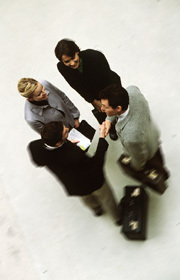 Tron Systems works with companies of all sizes across all business sectors. What all of our clients have in common is the desire to invest in technology to either save money or provide greater business opportunity. If your company already has an IT department and you are unsure of how our services may be incorporated, we can liaise directly with them to ensure that they are comfortable with whatever is planned. Most of our customers already have their own infrastructure and we work with them to ensure that all solutions fit within the corporate guidelines. For some projects, we will work with your IT staff in a combined project team working towards a common goal. What should I expect during development? Before starting any development we will provide a specification of what is to be provided. This may be detailed or higher-level, depending on the nature of the project. We will require you to review the specification and give your agreement to proceed based on it. All projects require user testing and sign-off at the end of the development before implementation is completed. You will be required to take time to complete this review thoroughly. Many of our projects involve prototyping, where development requires regular client review. For this type of project, we will require a greater level of involvement from you at regular intervals during development. Find out more about the development process. How will solutions be supported after the development has finished? Tron Systems are happy to hand-over support of any solution to your own IT department. However, many of our customers prefer to arrange for us to provide application support. This allows us to meet changing business needs quickly and efficiently. Find out more about how we provide support. What arrangements do I need to make for invoicing and payment? We normally require a purchase order or email giving agreement to proceed before work begins. Our normal payment terms are 30 days, subject to credit checks on your company. For small projects, invoicing is done at project completion. For larger development projects, invoicing is done monthly in arrears. Support is normally done via a pre-paid call-off agreement or invoiced monthly in arrears for regular support for larger customers. We prefer payment through BACS and will provide you with account details in order for you to set this up. Alternatively, payment can be made by cheque. VAT is payable on all UK invoices. If you are based elsewhere in the European Union and provide us your full VAT number with country code no VAT will be included on your invoice.